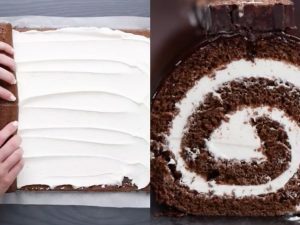 Ciocogirella, an alternative to the traditional Swiss roll cake! Beautiful to see and vary delicious to eat. When you cut out a slice, everyone will be surprised! 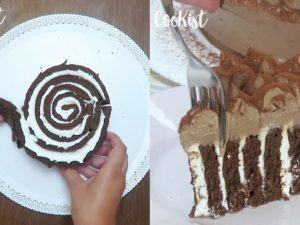 Ingredients: For the roll:4 eggs, 100g sugar, 100g flour, 4 tbsp cocoa powder, 2 baking powder. For the cream:400g whipped cream, 2 tsp honey, 200g mascarpone cheese. 1)Beat the eggs together with a pinch of salt and the sugar. 2) Once the batter is mixed well, add the flour, cocoa powder, and the baking powder. 3) Pour the batter into a baking sheet and bake at 190° for 20 minutes. 4) Once removed from the oven, let it cool. 5) Slice the sponge cake into 5cm wide strips. 6) Cover each strip with the cream. 7) Roll the first strip onto itself, and then roll the other strips around it. 8) Mix the remaining cream with hazelnut cream and use it to cover the roll. 9) Refrigerate for two hours and dust with some cocoa powder. Rose cake: a soft, fragrant brioche bread. Perfect for your breakfast!